Users can resize, crop, apply effects to images before uploading! I love this idea; Substantially every B2B developer needs it and nobody should have to deal with the amount of nonsense that is required to make it work well... I tried it and this does exactly what I'd want as a user. Really, really excited for you! Unlimited Uploads with Unlimited Image Processing on Unlimited domains! Save to Amazon S3 bucket or DigitalOcean spaces. Upload from Instagram, Facebook, Computer, Link, Image Search, Camera, Dropbox, Microphone, Youtube, etc. 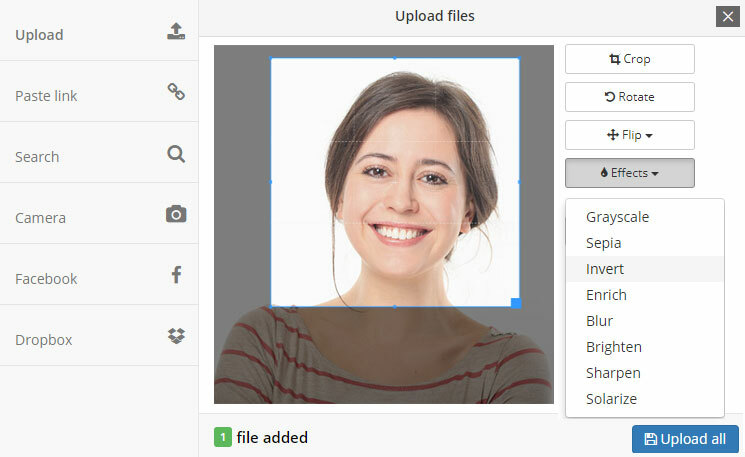 Users can resize, crop, apply filters to images. Auto-resize images before uploading to save bandwidth and time! With 160 live servers in 29 countries (56 cities) we make sure your users get fastest upload speed with minimum latency. Try our service free of charge for as long as you want without worrying about any additional bills during development. Want to customize look 'n feel, upload sources, etc? Use our WYSIWYG editor to customize all configuration. Dozens of in-built image processing tools for your users to crop, resize, apply effects to images before uploading! You can also customize maximum image resolution to automatically resize images and save bandwidth. No crippleware. There are no restrictions on the number of uploads, image transformations or domains on which you can use this. One super simple pricing plan that includes everything you'll ever need! *On Sale! 50% off till 30th Apr. Can't I use a jQuery plugin for this? Resumable uploads: you need a special architecture for supporting resumable file uploads (very important for mobile users with unstable networks). Upload acceleration: You want the upload server close to the user. E.g. If you user is in India, you don't want her to send files to a server 8500 miles away in America because that is slow and error prone. To handle this problem we have provisioned over 160 servers in 29 countries (56 cities). Other features: Many features like Image processing tools, S3 and Digitaocean spaces support, and more can take a lot of time and money to implement. It's better to spend that time and money on your own website or app! Uploader window is hosted on multiple servers which guarantees virtually ZERO downtime for our customers. Starting Jan 2019, as our commitment to you that we will maintain these standards, we are offering a DOUBLE MONEY BACK guarantee on all paid accounts. What this means to you is that if we can't maintain an uptime of 99% per month then for every minute of downtime (of our website or uploader) we will issue you a pro-rated refund for that month plus an equal amount of service credits for the next month. If you're on a paid plan it is possible to store uploads in your Amazon S3 bucket or DigitalOcean (DO) Spaces account for unlimited storage. Can users resize photos before uploading? Yes you can specify a maximum width and height for photos. Uploader window will resize the photos on client side (using HTML5 canvas) before uploading making photo uploads very fast. Yes we have a 50% promotional discount on all memberships until 30th Apr (for as long as you are a member). We also give discount on yearly payments (three months free or an additional 25% discount on all yearly payments). 20 accounts only. Business accounts are Sold out but Pro plans are still up for grabs. How many files can I upload each month? There are no restrictions on the number of uploads, image processing, domains, etc. Free users and Pro accounts get 200MB of storage capacity. Pro users get 20GB of storage, after which you can use your own Amazon S3 or Digitalocean spaces account for additional unlimited storage. Compared to the old method of file uploading where the whole file is sent as a one big chunk, a resumable uploader (like uploader.win) breaks uploaded files into small chunks and uploads each chunk separately. This way even if the connection breaks during an upload (happens a lot on mobile phones) the user only needs to upload the last chunk instead of uploading the whole file again. How does upload acceleration work? Upload acceleration works by connecting the user to a server closest to her location, which reduces latency and increases speed. E.g. If you user is in India, you don't want her to send files to a server 8500 miles away in America because that is slow and error prone (more latency, less upload speed). To handle this problem we have provisioned over 160 servers in 29 countries (56 cities). Will I lose my uploads if I cancel my membership? We will keep your uploads for 6 months free of charge after cancellation of your membership ( let us know if you want them removed sooner). It should give you enough time to migrate the data to your own servers. Uploads saved directly in your own Amazon S3 bucket or DO Spaces account are yours to keep forever. Yes our responsive design works on all devices and OSes. Is it possible to edit images before upload? Yes using our inbuilt image editor it is possible to crop, rotate, resize images before uploads. Users can also apply image effects and filters (like brightness, contrast, sepia, grayscale, etc). How secure is my uploaded data? Files in Inbuilt storage are encrypted on physical disks with 256-bit AES-XTS full-disk encryption. All data is sent to Amazon S3 or DO spaces via SSL only. We never share your data with any third party. Once stored, only you control access to this data. We don't store any sensitive information on our servers. We use Stripe's checkout for payment, so we never see your credit card details. Your accont password is hashed (using bcrypt) and we only send you email for account or service related issues (we do not share it with third parties).